Natural colors are used in making ebru for centuries, which are obtained from colored rocks and earth that contains oxidized metals or organic pigment colors that do not dissolve in water. 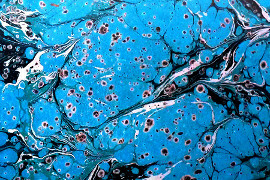 Oil colors and aniline paint is not used in traditional ebru-making. Because such colors dissolve in water and the paper is not receptive for those. In short, the colors must not dissolve in water, nor contain oil. First phase of preparing the colors is to crush them using water and marble blocks. 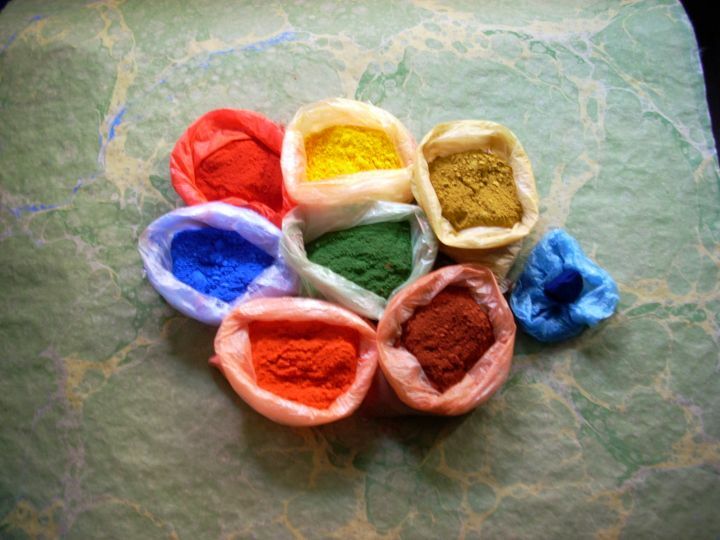 First, we mix the colors, which are made into a powder, with water to have a consistency like a cream. Then, with the help of the marble tool called desteseng (hand stone), we crush the color on a marble block. The hand stone and the marble block must be of equal hardness. Friction of marbles of different consistency cause corrosion and marble dust may mix in to the colors. The procedure takes about 2-4 hours depending on the nature of the material we are working with. How long a color should be crushed, a marbler learns it with experience. Whether a color is ready for use or not, we can only judge when we use it for the first time. During the procedure we keep adding water to the mix to keep the cream-like consistency. The second phase is where we steep the paint and it is crucial for ebru-making. After we are done crushing the color, we put it in a jar and add a mixture of water and ox gull. The paint must rest for a month or two, during which time it has to be mixed and shaken periodically and the water-ox gull mixture has to be renewed. If the colors are not steeped well, they will not hold on to the paper, they will be pale or cause other problems. Using an alum solution to make the paper receptive of the colors is not a technique of traditional ebru-making. Hence, the preparation of colors must be done appropriate to the traditional methods and with patience and effort. Ultrmarine: A pigment color, also called Badakhshi ultramarine. It is possible to use 45-50 different kind of material to obtain a concentrated and adhesive liquid for ebru-making. Most commonly used are the Carrageenan and the Tragacanth. Tragacanth is a type of natural gum resin with weak adhesive property, found on the trunks of various Astragalus species of Anatolia. It is used in medicine, cosmetics, and textile sectors. Carrageenan, on the other hand, is a type of seaweed, found mainly in northern European seas. Its spores are used for the size we use. 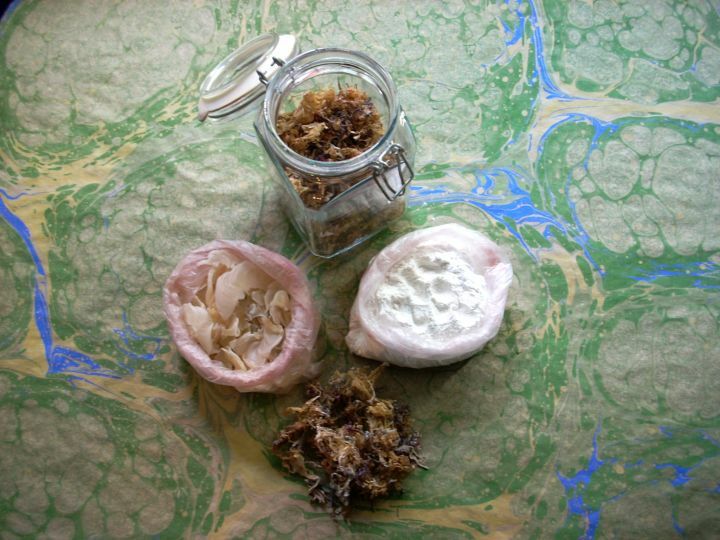 Preparation of Tragacanth is rather difficult and time-consuming compared to Carrageenan. Depending on the quality and the type of material, a Tragacanth solution needs about 5-7 days of mixing and resting. Carrageenan gives good results after only one day`s rest. It can be ready for use even in a few hours. In that case, the solution must be cleaned off of any bubbles and foam. Both solutions must be filtered before use and the consistency of the liquid must be set by adding water if necessary. In order to have ebru colors to spread on the surface of the liquid and to prevent them from sinking, we use ox gall, which is a surface active substance, breaking and regulating the surface tension. It also prevents colors from blending. Gall is a secretion of the liver, involved in the digestion of lipids. The type of gall used for ebru is obtained from cows and prepared using a bain-marie for prolonged usage. Sheep gall and Turbot gall are also used. Turbot gall gives good results for Kumlu (Sandy) Ebru. Şebek Efendi, in Tertib-i Risale-i Ebri (1608), reports that in older times tobacco leave extract was used instead of ox gall as a dispersant. Balancing the amount of gall we put in the colors is the most important and the hardest part of ebru-making. While first colors spread easily, since there is little surface tension, we need to add more ox gall in the following colors as the tension builds up with more colors. Unbalanced colors may sink, may be fragmented or even smudge when we take it on paper. Turpentine with chemicals or with oil derivatives shall not be used for ebru-making. Natural turpentine must be used. It gives a three dimentional, spherical effect to the colors. It is used to make ebru with sprinkles or in Battal type of ebru. 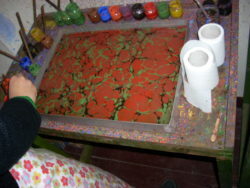 A tray is used to contain the liquid for ebru-making. It is made of steel, zinc, galvanized steel or clean timber. In case of a wooden tray, it has to be plated with tar. Rectengular tray has a depth of approximately 6 cm. The most widely used sizes are 68 x 100 cm, 34 x 50 cm, 17 x 25cm. A marbler should make his own brush. Old horses’ hair and dried rose twigs are used to make ebru brushes. 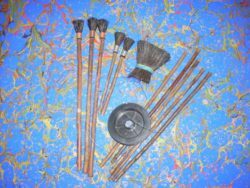 Horse hair is prefered, because it is thick and straight, so that you can splatter paint in a desired way. It also prevents bacteria and mold from multiplying and growing. Rose twigs are flexible and durable. With every strike we make to splatter paint, it bends allowing the paint drop on the surface in a proper way. However the real reason for the widespread usage of rose twigs stems from the fact that the master marbler Necmeddin Okyay was a master gardener of roses. 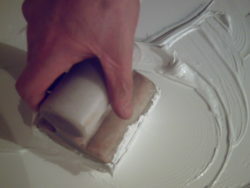 Brushes are bound by misina, and without using any kind of adhesive or tapes. With time, the strings of the brushes, which are kept in water, bend and that gives them a nice curve and it becomes easy to control the direction of the drops. 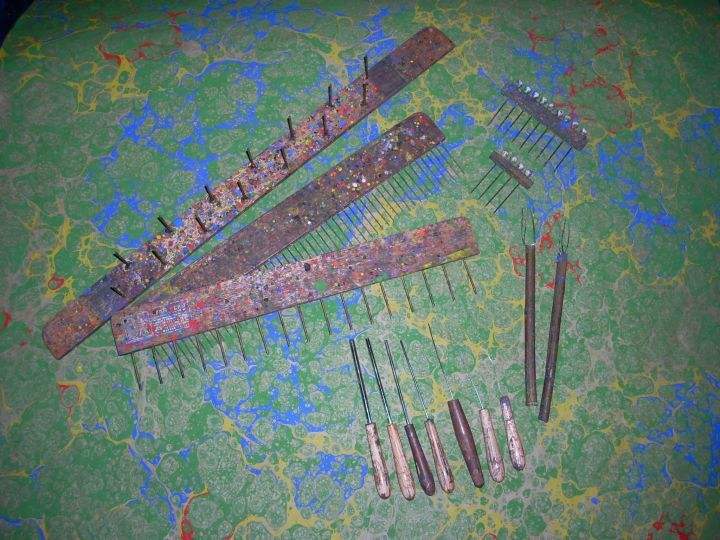 Combs are used in making combed designs, e.g. nonpareil or peacock etc. Teeth intervals may vary (2, 3, 4, 5, 6, 7, 9 mm). 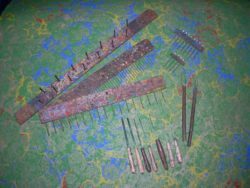 There is also a special type of comb, namely bouquet comb, used in making bouquet, peacock or scallop patterns. There is no standard size in combs. Every marbler makes his own combs according to his like. Awls are made of nails, strings and needles of various size and thickness. They are used for dropping and shaping ebru colors afloat on the surface. It is important that they are made of stainless steel. After marbled paper is dried, we use this tool to manually flatten the paper and polish it. 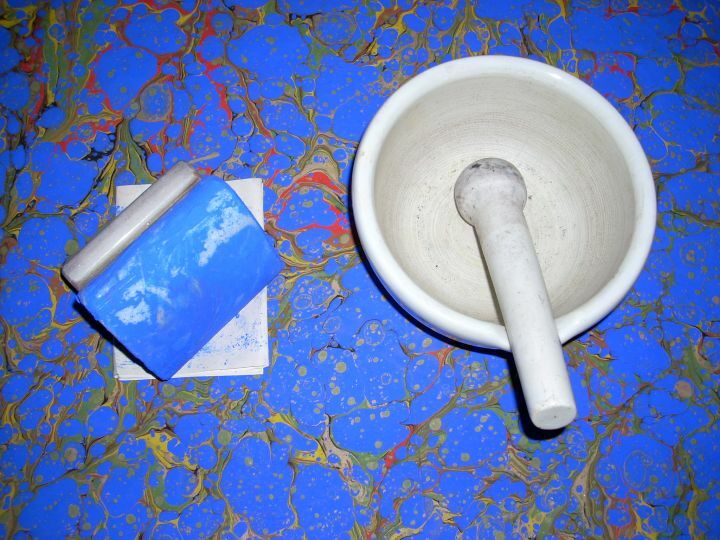 We press it against the paper and rub it all over the surface. This process is called burnishing. The design is preserved by the thin layer of ebru size which remained on the paper. It prevents smudging. Nowadays, this tool is very rare, so in its place we use a glass weight with smooth edges, such as a drinking glass or a jar, for burnishing.